Most advanced clear aligner system in the world. At Hyslop Dental we are specialists in Dental Implants. Replace missing teeth, or support fixed bridges or dentures. If you are looking for the smile you have always dreamt of, a dental implant to fill that embarrassing gap, or a family practice that offers a full range of dental care, then we are the practice to visit! Hyslop Dental and Implant Clinic is composed of an experienced team of dentists, dental hygienists, dental nurses and receptionists all committed to providing high-quality dental care in a relaxed and friendly environment. As a world-class dentist Southport is an ideal location to work from, as we are easily commutable from all over Merseyside and Lancashire, and can provide our services to any interested customers in a convenient, pleasant environment. We can provide a wide range of cosmetic dental work, including bridges, veneers and cosmetic fillings, as well as life-changing reconstruction and cosmetic work such as dental implants, cosmetic dentistry and quick straight teeth. Finally, we also offer cosmetic treatments based around facial aesthetics, including botox and dermal fillers. These treatments are provided by trained experts, and can provide a wrinkle-free face to smile at. 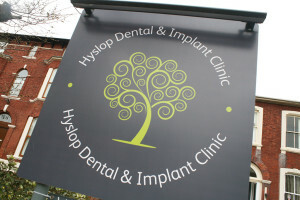 If you’re looking for dental implants in Southport, there’s no better option than Hyslop Dental & Implant Clinic. We are led by implantologist (Dr. James R. Hyslop) who can take you through the procedure step-by-step and make sure it is perfect for your needs. Dental implants are an excellent way to replace missing teeth, and provide a very secure and stable replacement guaranteed to last for years. Whatever your dental requirements we look forward to meeting with you to provide the care and service we would expect for ourselves. We are proud to provide cosmetic dentistry, teeth whitening, dental implants, veneers, dental crowns, quick straight teeth and many more.